When you are passionate about your work, it shows. At Beacon Transport, we love what we do so much that every driver we hire gets the backing of a dedicated team of professional truck drivers that truly believe our success is your success. We strive to create the best experience for our drivers. With that in mind, we wanted to account for all the reasons we came into this business in the first place. Let’s look at what life is like on the open road as a professional truck driver at Beacon Transport. At Beacon Transport, we know that one of the main elements truck drivers look for when selecting a company to lend their skills is the grade of trucks used to transport freight. As the saying goes, it’s not always about where you are going, but how you get there. That is why, as riding in style goes, Beacon gets a top-rating. 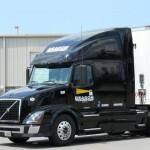 Our trucks are some of the most reliable ever made, the late model 670 Condo Volvos. Our trucks are streamlined with extra-wide, heavy-duty trailers to accommodate for the most freight per trip, so you can work smarter, not harder. The trucks get a higher safety rating than the trucks used by our leading competitors and come with a fuel bonus, so you can fill up as much as you need to along your trips without worrying about how it affects your pay. Did we mention you also get an inspection bonus just for keeping your truck clean? Beacon offers incentives for drivers who go above and beyond. So those extra things you do are reflected directly in your paycheck and are our way of saying thank you for driving with Beacon. Beacon Transport drivers in Nashville and throughout our locations are the soul of what keeps our business vital, so no matter where you are in your journey, you have the opportunity to earn rewards at every turn. For example, just for completing orientation you are paid according to your salary. When you complete a trip, there is a pickup pay. We also offer pay for layovers and detention. Upon referring a friend to Beacon, you get rewarded when they complete orientation and are an established driver. In addition, we reward your hard work with pay for taking some R&R. Why? Because what better way to enjoy your downtime than to know you are getting paid to enjoy it. These are just some of the ways we reward your driver experience at Beacon Transport. Contact us to learn more. When we get to ride in style, what do we do? We get the urge to share the experience with someone we care about. Beacon Transport understands that, so whether that someone happens to be your pet, a family member or friend, we advocate that you have a bit of company – so go on, share the ride. At Beacon, our passenger and pet policy means when you want to be alone you can be and when you want someone there, we have you covered there, too. Truck drivers are not the type to sit still for too long. That said, you also do not want to stretch yourself too thin either. We put you on the open road with the freedoms involved with truck driving, in style, with great benefits and rewards, but without the wear of driving too far and for too long. As a regional company, Beacon Transport drivers travel to states touching and just outside of our central headquarters in La Vergne, TN. With no routes to New York City or New England, you can get to your destination faster with the satisfaction of knowing that home is not too far down the road. We are lighting the way to your success with our trucking jobs in Nashville, TN and neighboring states. Learn more about our driver journey experience or contact Beacon Transport to get on the road with us today!